by Barnet, Sylvan; Burto, William E.; Cain, William E.
The balanced coverage of classical and contemporary selections helps readers from all backgrounds realize the underlying commonality among cultures as well as recognize themselves within the literature. This anthology contains over 375 readings; four casebooks; and abundant visual material including facsimiles of manuscripts, author portraits, visual portfolios, and spot images. A market leader for more than 30 years, Barnet's Introduction to Literature continues to uphold the traditions that have made it a success a rich blend of both classic and contemporary selections as well as Barnet's signature "how-to" instruction on the elements of literature and the writing process. The new edition features a wealth of contemporary stories and a new chapter on graphic novels that were chosen for their student appeal. New selections include 18 stories, 24 poems, a one-act play, Samuel Beckett's "Krapp's Last Tape," and a casebook on Arthur Miller's Death of a Salesman. The “Poetry and Translation” chapter gives a student essay in which the student discusses his translation of Federico Garcia Lorca’s poem “Despedida.” Hints for translating as well as advice on translating haikus are given. Suggested writing assignments are also included. The balanced coverage of classical and contemporary selections helps students from all backgrounds realize the underlying commonality among cultures as well as recognize themselves within the literature. It is a great textbook. It contains a wealth of poems, stories and advice between the poorly-made pages. And, since the pages are thin, it wasn't as heavy to lug around campus. Very good content though, as I said. The stories are multi-national; there is abstract and realistic, old-fashioned and very modern, some ancient and even the lyrics to 1960's folk songs! One of my favorite lines in the textbook is "Margaret are you weeping over golden grove unleafing?" I also like the old sailors' poem Western Wind "Western wind when wilts though blow? The small rain down can rain. Christ that my love were in my arms and I in my bed again." 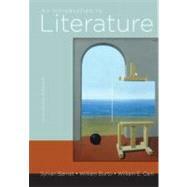 An Introduction to Literature: 4 out of 5 stars based on 1 user reviews.